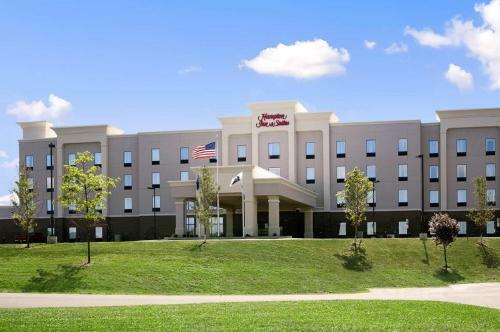 This Mansfield, Pennsylvania hotel is located 1 mile from Mansfield University. Facilities include free Wi-Fi, an on-site fitness centre, and a daily hot continental breakfast. A flat-screen TV, work desk, and coffee machine are featured in every guest room at the Hampton Inn & Suites Mansfield. They are styled in bright colours and dark wood furnishings. Guests can use the laundry facilities at the Mansfield Hampton Inn. A business centre with copy and fax services is also available for convenience. Restaurants including Papa V Pizzeria and Cast & Crew are within 5 minutes’ drive from the hotel. The Grand Canyon of Pennsylvania is 12 miles away. The Lambs Creek Bike & Hike Trail is 3miles away. You must show a valid photo ID and credit card upon check-in. Please note that all special requests cannot be guaranteed and are subject to availability upon check-in. Additional charges may apply. Guests are required to show a photo identification and credit card upon check-in. Please note that all Special Requests are subject to availability and additional charges may apply. the hotel Hampton Inn & Suites - Mansfield so we can give you detailed rates for the rooms in the desired period.